In 2016, Buck & Knobby Equipment Co. built its first Ohio dealership in Holland, marking a return to the Toledo area more than 30 years after relocating its headquarters to Ottawa Lake, Michigan. Rudolph Libbe Inc. was design-build contractor for the 6,000-square-foot JCB dealership which includes a showroom, sales and administrative offices, parts department and six-bay service shop. 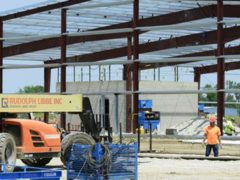 Rudolph Libbe and GEM Inc.’s own craftspeople performed sitework, concrete, masonry, carpentry and erected the Varco Pruden pre-engineered steel building. A 4-ton overhead crane was incorporated into the service area design. Construction was completed within six months. The new location rents and sells JCB backhoe loaders, wheel loaders, excavators, telehandlers, skid steers and compact track loaders. The facility creates customer confidence in our ability to properly support their equipment in a state-of-art environment. It was a pleasure to work with the highly skilled team at Rudolph Libbe which delivered an outstanding new facility we all can be proud of for many years to come.